The Helly Hansen Legendary Insulated Ski Pant is one of Helly's best sellers for obvious reasons: classic ski performance with a flattering fit that’s neither too baggy, nor too tight. Stretch fabric provides optimized comfort and easy movement, and allows the pant to fit closer without being uncomfortable. 60g of bulk-free PrimaLoft insulation and waterproof Helly Tech Performance fabric keep you warm and dry should you take a spill or two. You’ll wear and enjoy the Legend pant for years to come, and the vibrant colors coordinate perfectly with your favorite Helly Hansen jacket. "Are these pants super white or more of an off white? The pictures look different. I have a Bogner jacket that's off white and navy I'm trying to match. " "These pants are a bright white color. I would recommend getting a Bogner pant that is off-white to match. 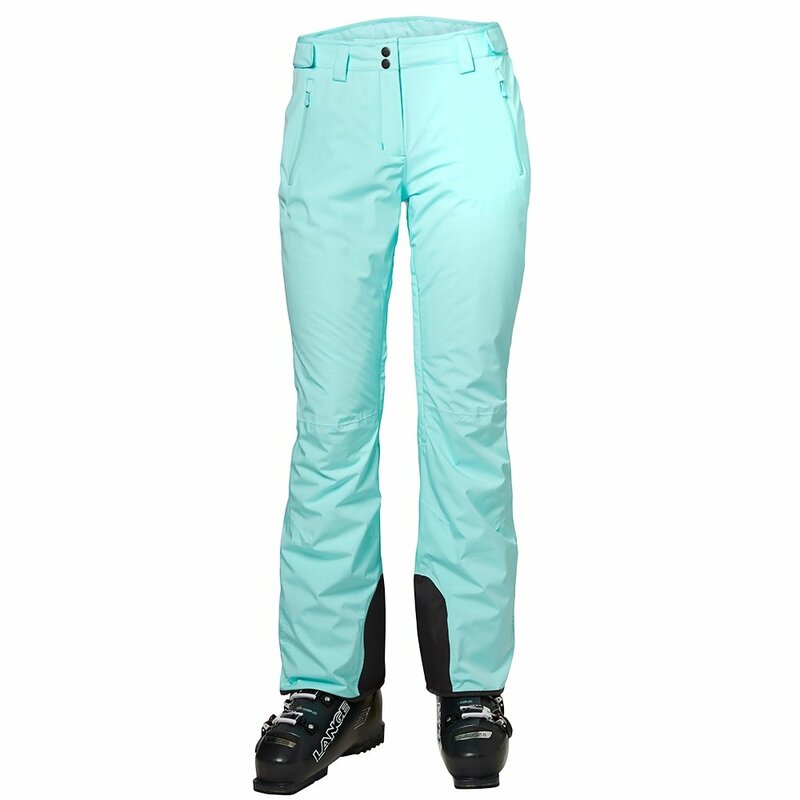 We have the Bogner Elaine Softshell Ski Pant, the Bogner Rominja Insulated Ski Pant, and the Bogner Lita Insulated Ski Pant in off white so you have some really great choices there!" "I am looking for a high waisted - fits AT the waist not the hip ski pant. Would this one be what I am looking for? If not suggestions please for 5 ft 4 in, @ 130 lbs, usually size 6 or 8 in a regular pant. I am using my daughter's old spider bibs -- love them but she needs them back! " "Yes, this looks like a good option for you to try as it is not a low rise pant; it does have more of a classic fit that sits higher on the waist. " "Is the rock color a gray? I have a Helly Hansen Mystery Jacket that is gray, blue and white and I am trying to find gray pants to match." "The 'Rock' color is a muted green with hints of gray." "In 2014 I bought a Helly Hansen Legend insulated ski pant…It seems to be same pant...Did they just change the name from Legend to Legendary?" "Yes, these pants will be very similar to the Legend from a previous season! They are going to have some minor stylistic differences. One example would be that the Legend had the black zippers on the side while these pants do not. However, the insulation and waterproofing will be about the same. " "What is the inseam length of a size M or size 8"
"It looks like the inseam is going to be 31-31.5 inches for a size medium. You can also view more sizing information on our size chart!" "What is the waist, hip and length of the small and medium"
"You can view all of those measurements by clicking on the size chart. Hope this information helps." "Do these have option for suspenders to be attached? if not - do you have other options? " "The Helly Hansen Legendary Ski Pant has a waistband adjustment and belt loops but no suspenders. Click HERE for seperate clip on suspenders. Another option would be BOULDER GEAR PINNACLE SKI BIB. Hope this information helps!" "What is the inseam for a size small"
"The inseam in a size small in the Legendary ski pant is 30-30 1/2 inches (77.5-80.5 cm). If you have any other sizing questions click HERE for Helly Hansen's size chart. Hope this information helps!" "Do you have women’s ski pants in short length?" "Thank you for your inquiry. We only carry the Helly Hansen Legendary Insulated Ski Pant in regular inseam, which is (XS) 29.5-30.5, (S) 30.5-31, (M) 31-31.5, (L) 31.5-32 (XL) 32.5-33. We hope this information helps! " "What color is Persian red. Looks deep pink in picture"
"Thank you for contacting us. The Helly Hansen Legendary Insulated Ski Pant in the color Persian red does have a deep pink tint. We hope this information helps!" I ordered the size XS and they fit perfectly, not too long or wide in the legs. I'm 5'3" and 106lbs. It's hard to find ski pants that fit. Great shade of white too! Very comfortable, fit as expected and perfectly warm (we went skiing at Park city on March 1-5 if you want context for the temperature). These pants are perfect for skiing in CO winters. I really appreciate the fact that you can adjust the waist to fit perfectly. Wanted a warm comfortable pant and this pant delivered. I bought these Helly Hansen pants in white. My only complaint is that after washing them the zippers turned yellow, and I did follow washing instructions. Very unfortunate because they are very comfortable.